Apples of Gold Jewelry's gorgeous heart print Mother's Day pendant in silver is a beautiful gift for mothers, grandmothers, and those who can appreciate a beautiful pendant with plenty of personality and style. The heart shaped pendant, which hangs at an angle when placed on a chain of your own, measures just under 1 inch by 0.63 inches wide, and is made from .925 sterling silver. The polished heart shape pendant features a thumb print on one side, while the other side of the heart remains plain. The hoop where you loop the chain through is part of the pendant, giving it an appearance of being in one piece. 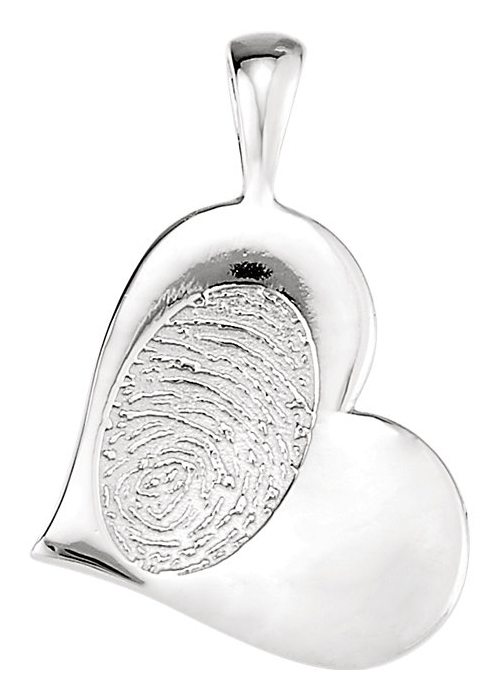 We guarantee our Heart Print Mother's Day Pendant in Silver to be high quality, authentic jewelry, as described above.